Tortoiseshell is a popular pattern for a reason. The intricate combination of amber, orange, yellow, and brown are found in glasses, guitar picks, jewelry, and many other products. In the US and Europe, if you see that pattern, it’s likely synthetic. But travel to the tropics and that beautiful necklace may from an actual turtle, the hawksbill sea turtle. Purchase one and bring it home, and you’re not only contributing to the extinction of an endangered species, you could also face fines at Customs entering the country. 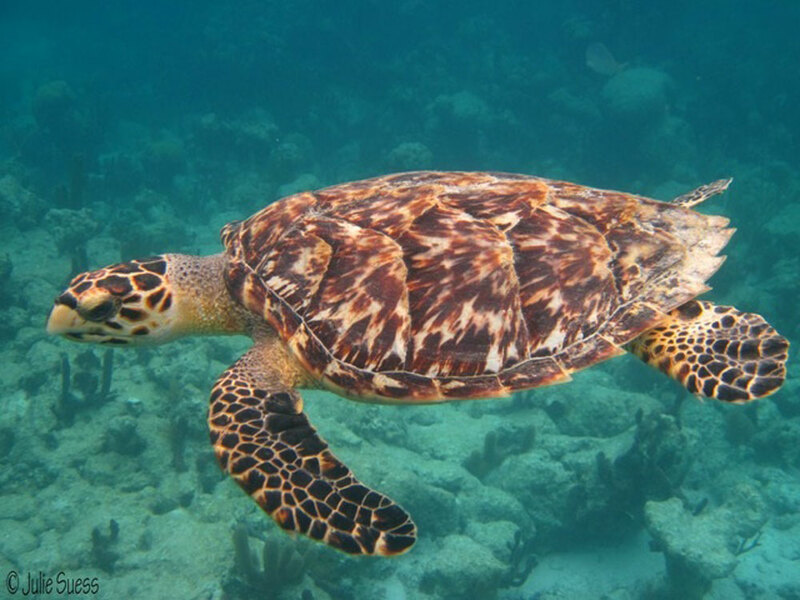 The shell of the hawksbill was plastic before plastic was invented. For thousands of years, artisans crafted a wide range of products from the carapace of these turtles. Millions of hawksbills are hunted for this trade, many of them going to Japan for their “bekko” trade. The legal international trade was mostly outlawed in the 1970’s, though Japan and a few other countries maintained their trade until the 1990’s. But the illegal trade continues in many countries, with travelers being the top consumers. This trade has had an enormous impact on coral reefs around the world. Hawksbills favorite food are sea sponges, which compete with coral for space. An adult hawksbill can eat up to 1,000 lbs of sponges a year, which allows reefs to grow and flourish. This species is now considered critically endangered, with only an estimated 15,000 adult females left, a drop of more than 90% over the past hundred years. Latin America and Asia are the most common places where this trade continues. In our Endangered Souvenirs report, Nicaragua and Colombia were the top places where hawksbill shell was found, primarily around Managua and Cartagena respectively. But significant amounts of these products were also found in Costa Rica, El Salvador, Honduras, and Cuba as well. In Asia, the legal sale of these products still happens in Japan (though it is now illegal to import new shells). The illegal trade continues in China, Indonesia, Vietnam, and Papua New Guinea. But there are many other places where they can be found, so be sure to learn how to recognize these products. When you wander through markets and souvenir shops in the tropics, keep an eye out for the familiar pattern. Sometimes these products can be mistaken for cow horn, coconut shells, or plastic imitations. Look for irregular shaped and asymmetric patterns of these colors that go through the product (as opposed to on the surface). If you aren’t sure, just avoid the product altogether. And when you are sure, don’t purchase anything from that vendor and tell them why. With enough pressure from consumers, shops and vendors will stop selling these products. Instead, purchase souvenirs made from things like coconut shells or recycled products made local artisans.